Graphic Number Birthday Photo Thank You by Pink Peppermint Paper, LLC. 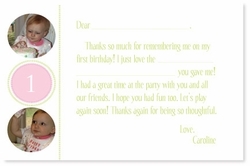 Thank party guests and let those who couldn't be there see the fun you all had with this sweet photo thank you note. Available blank or as fill-in-the-blank with your chosen text.